On the mound La Flama Blanca notches a nailbiter save, followed by our introduction to his new partner in crime, and catcher Shane Dog. They think they run the show on the Myrtle Beach Mermen, and their teammates barely tolerate their racism, and stupid clubhouse antics. 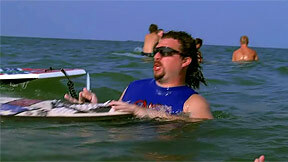 During a post-game trip to the beach with their high school flings, Kenny Powers reveals the title of his forth-coming audiobook to be “I’m F*cking Back.” He is so confident in his major league comeback being a success, that he actually “pre-wrote” the book. Kenny Powers might be having success on the mound, but that is not the case in his relationship with April, or their son Toby. At his son’s first birthday party Kenny wants nothing to do with the kid, and causes a scene with April in front of everyone. Before this, April questioned her decision to even have the child in a conversation with Cassie. Kenny sneaks out of the party, but for some reason April decides to pay Kenny a visit in Myrtle Beach a few days later. They smooth things over, and Kenny suggests they hit the town proper for some excitement without the baby dragging them down. On their date night, we learn that April Buchanan may not be so straight-laced after all. They shotgun beers, get high, take pills, and April gets in a cat fight on the putt-putt course. This type of wild behavior is the bond that Kenny and April have shared all these years. They commemorate their crazy night with airbrushed t-shirts, and go home to hook up. This was the first episode (and better be the last) of Eastbound & Down without an appearance by Stevie Janowski. Since there was no Stevie, we used Kenny’s new sidekick Shane instead. Shane Dog and Kenny had several funny back-and-forth segments making jokes in the lockeroom, picking up high school girls, and carrying on about Top Gun. Regardless of who is Goose or Maverick, you can't help but notice the gay overtones being implied, just like the movie. Or is it foreshadowing? 1. DO NOT help out whatsoever with your child’s first birthday party. 2. DO smoke joints in the bushes at the party, and wash down some pills with a pint of Southern Comfort. 3. A Playstation 3 is a perfectly acceptable gift for a 1 year old, since it plays Blu-ray discs, and the high definition content is easier on his eyes.